Mexican Fan Palm – These palms are slender but can grow to over 75 feet tall. California Fan Palm – They have a larger diameter than the Mexican Fan Palm, but don’t grow quite as tall. Canary Date Palms–These palms don’t grow as tall, but do have large, bushy fronds. Date Palm–This type of palm has a trunk about 18 inches in diameter and grows to be approximately 60 feet tall. You have to care for each type of tree a little differently. 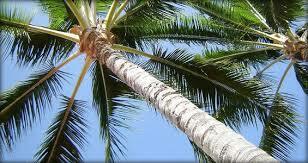 With the Mexican Fan Palm, for example, that type of tree can handle more drastic pruning. Generally, you’ll be okay if you prune from a 10 o’clock to a 2 o’clock position, but you do have to make sure you leave enough fronds to maintain the health of the tree. California Fan Palms require a little extra caution because the fronds and seed pods grow larger and are heavier. If you hire a tree service, they cost a little more to trim. With Canary Date Palms, you have to prune them between early May and early June. If you trim them earlier, they’ll grow new date stocks and make a mess of your yard. If you trim them later than that, the fruit has already ripened and makes trimming more difficult. The Date Palm is more sensitive to pruning. Trim these palms too much, and you’ll harm the tree. If all this sounds too complicated for you, remember you can always hire a professional tree service to do the care for you instead. Watering: If you plant a new palm, make sure you use a 30-50% sand/soil mix. Water it every day of the week also. The tips of the fronds will turn brown if your palm isn’t getting enough water. For an established palm, watering twice a month during the summer and once every six weeks during the colder season will suffice. Fertilizing: Don’t fertilize a new tree for the first 3-4 months. You could harm the tree more than anything else. Use Good Soil: Canadian peat moss is one of the best soils for palm trees to grow in. Remember, the cheaper the soil, the worse the results. Don’t ever buy soil mixed with fertilizer. Pruning: In most cases, fronds are shed naturally. However, if you notice yellowing or browning fronds, remove them. They take much-needed nutrients away from other parts of the tree. Follow these tips, and you’ll be okay. And remember, if you need palm tree removal or tree trimming done for you, you can always contact Nevada Tree Service at 702-433-4700.